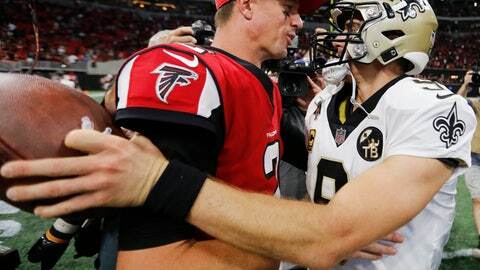 NEW ORLEANS (AP) — The latest chance for Saints fans to show Drew Brees their gratitude for the many memorable, triumphant moments he’s brought them comes on Thanksgiving night. The Saints (9-1) are riding an NFL-high, nine-game winning streak as the rival Atlanta Falcons (4-6) land in New Orleans, so don’t expect a sleepy crowd in the Superdome, no matter how well-fed. Some 13 seasons after Brees embraced the challenge of resurrecting a downtrodden franchise in a disaster-ravaged city, his level of play, at age 39, appears as high as ever. He is on pace to break his own single-season record completion rate of 72 percent. His touchdown-to-interception ratio is 25-1. And the Saints, averaging 37.9 points per game, are threatening to score more points in a season than any team in NFL history. With the luxury of a strong offensive line and running game — not to mention playing with a lot of leads — Brees has been able to throw selectively and efficiently. He has also benefited from receiver Michael Thomas’ monster year, but demonstrated in a 48-7 win over Philadelphia on Sunday that he can connect, to prolific effect, with younger, lesser-known targets as well. “There’s a lot to be said for experience,” a grinning Brees said as he reprised an old expression about wisdom trumping youth and skill. The Falcons aren’t feeling so good about their season so far. Their last-second loss to Dallas last Sunday dropped them five games behind the NFC South-leading Saints with six games left. While the teams are spread apart in the standings, they played each other pretty close the previous time they met in Week 3 in Atlanta. New Orleans needed a late TD to force overtime and won in the extra period. The Saints are nearly two-TD favorites in the rematch, which would seem appropriate given New Orleans has outscored its past two opponents 99-21 combined. But Brees’ experience against Atlanta tells him otherwise. If Alvin Kamara fails to match the 190 yards from scrimmage he had against Atlanta in Week 3, it might have less to do with Atlanta’s defense than with fellow Saints running back Mark Ingram’s resurgence. Ingram did not play in the previous meeting because of a four-game suspension stemming from his positive test for a banned substance. In their past two games, the Saints have averaged 208.5 yards rushing, with Ingram have rushed for 100-plus yards in each. Jones’ touchdown drought is over. He has TD catches in three straight games after having none in Atlanta’s first seven. That doesn’t mean he wasn’t productive all along. Jones leads the NFL with 1,158 yards receiving. “He’s been playing so well for us all year and has been so consistent,” Falcons quarterback Matt Ryan said. While Brees has not thrown an interception at home this season, the Falcons counter with safety Damontae Kazee, who leads the NFL with five interceptions, a career high. He is the first Atlanta player with as many as five interceptions in a season since 2012, when Thomas DeCoud had six and Asante Samuel had five.